Former Arsenal star Paul Merson has criticised the Gunners defence after they slipped up and were held to a 1-1 draw by Atletico Madrid in the first leg of their Europa League semi-final tie. The hosts look to be in a commanding position at the Emirates, as after Atleti were reduced to 10 men early on and had Diego Simeone sent to the stands, Arsenal found a breakthrough from Alexandre Lacazette with 30 minutes still to play. 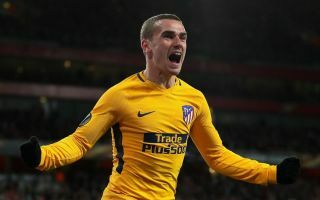 While many would have hoped the Gunners would have gone on to take full control of the tie by ensuring that they travel to Spain next week with a commanding lead, they ultimately did the opposite and saw Antoine Griezmann bag a crucial away goal and put the La Liga giants in pole position to advance. In turn, it was a bitterly disappointing night for Arsenal and a possible missed opportunity, and Merson wasn’t impressed with what he saw from the defence again and seemingly wasn’t surprised in the least bit that they had let the side down. “Typical Arsenal,” Merson said on Sky Sports’ The Debate. “They were cruising along and they were playing well, creating good chances. “You just think keep it tight, win 1-0 and we’ve got a chance. Then the goal they give away is just typical Arsenal. I’ve seen it before. Arsenal will now have a real task on their hands as they’ll have to score at the Wanda Metropolitano next week to have any chance of progressing to the final. Having seemingly been given such a great opportunity to take a big lead with them to the Spanish capital, it remains to be seen if it comes back to haunt them.